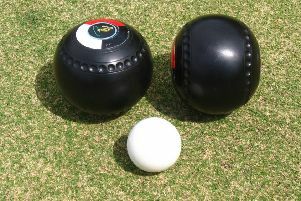 ALEX MARSHALL admitted he “just couldn’t get a feel” as he failed in his bid to claim a record-extending 21st world bowls title. The East Lothian ace lost out in the final of the Just Retirement World Indoor Mixed Pairs alongside partner Julie Forrest of Teviotdale, leaving Arbroath’s Darren Burnett – a Men’s Pairs winner on Monday with Blantyre’s Stewart Anderson – with his second world title in as many days, this time with Ipswich player Katherine Rednall. Marshall and Forrest made a slow start and found themselves 5-1 down, eventually losing the first set 11-5. However, they came flying out of the blocks in the second, chalking up a full count for a confidence-boosting four shots. They once again held sway on the second end, but an amazing runner from Burnett into a dangerous head, which could have potentially left him staring down the barrel at 8-0 down, yielded a double. Marshall and Forrest continued to plug away and a treble gave them an 8-4 lead. However, once again that man Burnett turned the tables with a masterclass display, reeling off eight shots over the next four ends. A single brought the Scottish duo to 9-12 with only one end to play where they faced an uphill struggle, needing a full house to force a tie break. But, despite being in the target area with his last bowl and a possibility of securing that four-shot target, the head once again broke unfavourably for them and they lost a double and the set 14-9. Marshall will now turn his attention to the singles event where he will have a record seventh title in his sights. He was set to be in action in the second round today against Blackpool’s Mark Dawes, the winner lined up to face either former winner Anderson or 2006 champion Mervyn King.